Looks good, Carl! I'll probably just keep an old coffee can in my boat. I bet you feel like a king with your throne! Okay, I've recovered from the last round of toilet jokes! Time for another update. Bracing myself for the next round! I have a need for a recessed toilet paper dispenser so that it fits under the head box cover. Couldn't find anything I liked, so I made my own. I've also got the ventilation fan housing assembled. Both of these items still need a bit more work as well as epoxy coating. Just don't moor downwind of Carl ! I'm kidding. It looks great Carl! All the answers wrapped up in 1 unit for under a $100. Matt and Matt, thanks for the response. I considered a porta potty early on but decided against it as I am trying to do as much of this on my own as possible. Given how I expect to use the boat (as a day trip boat and not as a live aboard or even a camper), the composting toilet will likely be used very little. By separating the waste into liquid and solid, it will be easy to dispose of and there will be little smell to concern myself with. On another note, I was discussing my build with a project manager I work with and he was asking me the same question I get all the time; "When is it going to be ready?" My response to this used to be 2 or three years, but as the years go by, I am no longer confident of any final date. 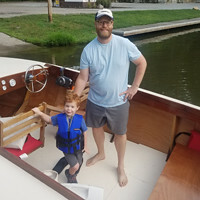 But what I did realize last year, and what was I reminded of by the discussion with the PM was that priorities have to be set and functionality has to take priority over a finished project, or I will never get to the point I can use the boat. Given that, I am considering what I can delay and what I really need to get done in order to start using the boat. There's still quite a bit of necessary items to complete, and a huge number of finishing items to complete. I can see myself working on this 5 years from now, still trying to get her to a complete state. I don't want to wait that long to get out on the water. So I will be re-prioritizing tasks and starting on the new more aggressive timeline soon. One thing I won't be doing, if I have any control over the situation, is giving up on the build and all decisions made for functionality will not compromise the final product. I still want my beauty queen! I see where you are coming from on getting her on the water. As time drags on with my build, I am beginning to wonder if I'll ever get finished. I have spent an entire year trying to get the finish I think I want. Is it really worth it? Just a quick update. Making progress on head box parts. I am going to finish most of the head box assembly and then move on to adding additional floor bracing in place or work on getting the electrical panel installed. This is part of my new plan to get more functional work done. Here is the lid that sets next to the toilet seat. Still need to make a wooden frame and cover for the steel compost bin. The inner hinged lid has hardwood edges around the oval cutout now. This is the last step on this before encapsulation and paint. This is the access panel for the back wall (outboard side) of the head box. This allows me to get to the ventilation fan and bilge hoses behind the head box. Lots of detail Carl... looks great! The longest journey begins with a single step… then repeat as necessary! I like how you've trimmed all that plywood with hardwood. That's going to look nice. I'm going to have to remember that trick. The hardwood edges was done primarily to give a more durable edge to the parts that moved like the hinged inner lid. But I liked the look enough to carry it over to other parts. All of those parts will be painted on the plywood and leave the edges bare (with epoxy encapsulation of course). The partition I made recently is plywood with a hardwood edge and veneer to make it look like Cherry. Same general idea as before but with the addition of the veneer (instead of paint). I'll be using variations of these two ideas throughout the interior. The veneer will either be paper backed veneer (Cherry) or 1/8" Cherry wood depending upon how I want to use the part and what thicknesses I currently have in the plywood stack. don't forget the baby wipe container.those are really nice size.Huggies with aloe feel really good and are huge.